Gulf breezes may keep Sarasota and Manatee counties a little cooler than inland in Florida, but it is still going to be a long, hot summer. One of the best defenses against the hot summer sun is energy-efficient window treatments and coverings. And with the variety available nowadays, you won’t have to compromise on interior design at all. In fact, the U.S. Department of Energy, at energy.gov, recommends the following methods of window coverings to save energy resources and money. AWNINGS: Window awnings can reduce solar heat gain in the summer by up to 65% on south-facing windows and 77% on west-facing windows. 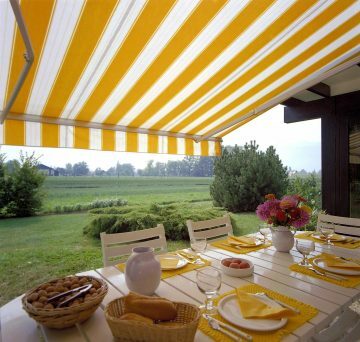 Use an awning to shade one window, or have an awning custom-made to shade the entire side of your house. BLINDS: Window blinds – vertical or horizontal slat-type –are most effective at reducing summer heat gain (rather than winter heat loss). Highly reflective interior blinds, when completely closed and lowered on a sunny window, can reduce heat gain by around 45%. They can also be adjusted to block and reflect direct sunlight onto a light-colored ceiling. A light-colored ceiling will diffuse the light without much heat or glare. Exterior blinds (rollers), usually made of wood, steel, aluminum or vinyl, are mounted above the window, and side channels guide them as they’re lowered and raised. When you lower these blinds completely, their slats meet and provide shade. If partially raised, the blinds allow some air and daylight to enter through windows. DRAPERIES: A drapery’s ability to reduce heat loss and gain depends on several factors, including fabric type (closed or open weave) and color. With such a wide variety of draperies available, it’s difficult to generalize about their energy performance. But for sure, close the drapes on windows receiving direct sunlight to prevent heat gain. Studies demonstrate that medium-colored draperies with white- plastic backings can reduce heat gains by 33%. Draperies also stay cooler in the summer than some other window treatments because their pleats and folds lose heat through convection. SHADES: When properly installed, window shades can be one of the simplest and most effective window treatments for saving energy. Shades should be mounted as close to the glass as possible with the sides of the shade held close to the wall to establish a sealed air space. Be sure to lower shades on sunlit windows in the summer. For greater efficiency, use dual shades – highly reflective (white) on one side and heat absorbing (dark) on the other side – that can be reversed with the seasons. SHUTTERS: Window shutters—both interior and exterior—can help reduce heat gain and loss in your home. Interior shutters need a clear space to the side of the window when they’re opened. They also require hardware that is fastened to the window jams or trim. Properly designed exterior shutters may provide the best possible window insulation system. They offer several advantages including weather protection and added security. Another method not mentioned by the U.S. Department of Energy is WINDOW TINTING. Window tinting is very effective but ONLY if you choose the right type of material. The biggest impact will be on south-facing windows. The best way to be sure a tinting treatment will cut down on heat is by checking the factory specifications. Be sure to work with a reputable company and get your windows tinted professionally.